One of California’s first art movements to command national respect was the watercolor style developed by a group of Southern California artists in the early 1930s. Named the “California Style” it is recognized by large size papers bold brushwork, and strong colors. It was a distinct departure from its predecessor, the English School of watercolor painting where delicate pastel colors depicted charming subjects, such as prosaic landscapes, on small papers. Many of the California Style artists, like Lee Blair, were trained at Chouinard Art Institute, worked for one of the motion picture studios (often in animation), and painted together on the weekends. Like most 1930s artists, they painted “American Scene” subjects such as farmscapes (emphasizing the bounty of the land) or views of blue collar Americans busy in their everyday urban activities. 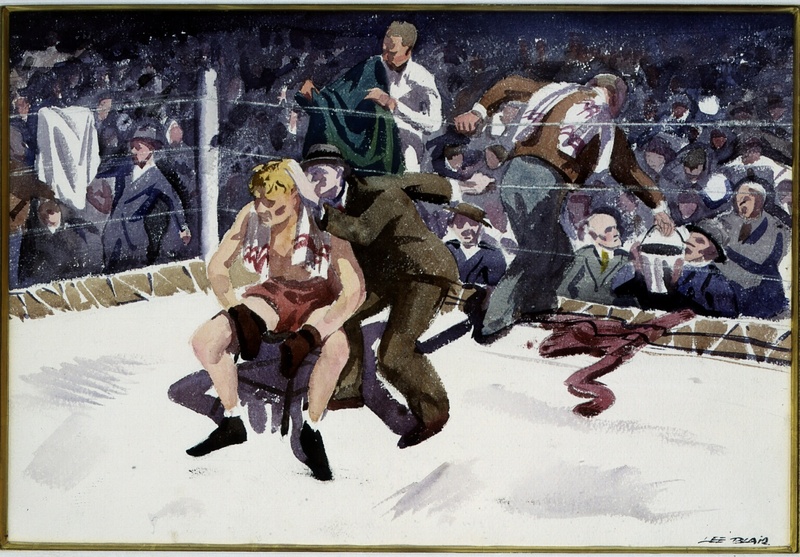 Untitled depicts a fight at the Olympic Auditorium in Los Angeles, where Blair often went on the weekend for entertainment. Such a subject was a perfect “American Scene” theme as it showed an average American not only earning his living through manual effort (admired in the Depression over intellectual and financial effort) but an audience enjoying the inexpensive blue-collar “entertainment”. Blair’s standard practice was to sketch on site and then afterward, in his studio, work the sketch up into a painting. He would stretch a sheet of Whatman’s watercolor paper on a piece of plywood, wet it to make it flat, roughly draw in the main points, and then apply the paint. He used a number 12 brush – the large size encouraged bold brushwork and discouraged detail. His paints were by Windsor Newton. Exhibitions and Publications: reproduced in color in Nancy Moure, California Art: 450 Years of Painting and Other Media, Los Angeles: Dustin Publications, 1998, p. 243; exhibited, Regionalism: The California View, Santa Barbara Museum of Art, June 25 - August 14, 1988, as "Untitled"; exhibited: California Watercolor Movement, South Coast Plaza annex of the Orange County Museum of Art, through October 31, 1999;Tone Price Gallery, LA; Jack McGowan Aug.1937.